Back in the day, when approaching Lisbon by ship, one could see clearly the seven hills. There were in fact eight. But the moniker stuck anyway. Regardless, people still had to get around, and the hills were bound to pose a challenge. As the city grew, administrators and planners employed every possible means to navigate its undulating topography. Stairways were built, elevators were erected, and in 1884, Ascensor do Lavra, the first street funicular in the world, was inaugurated. Three funiculars and an elevator survive to this day, each of them declared a national monument. To many, they’re a work of art. To most Alfacinhas, as the locals are referred to, they remain a matter of convenience. They rattle, they hum; they grind and squeak their way up gravity-defying slopes and twisty, windy roads. They’re known to hold up traffic; they appear at their own fancy, and when they do, good luck finding that vacant seat. More touristy than utilitarian today, and only a shadow of their past, they are the very lovable Remodelados, Lisbon’s bright yellow vintage trams. A city icon in their own right, you’d be remiss not to experience one. Among the six tram routes still in service today, No.28 is by far the most popular, as it traces a route through the historic city center. But for a more relaxing experience, consider No.15, which runs along the Tagus riverfront to the western district of Belém. Probably best known for its Mosteiro dos Jerónimos, a truly magnificent monastery dating from the 15th-century, Belém, the Portuguese word for Bethlehem, is also home to exquisitely landscaped gardens, a half dozen museums, a vibrant waterfront, and two imposing monuments. Padrão dos Descobrimentos is the first of these. 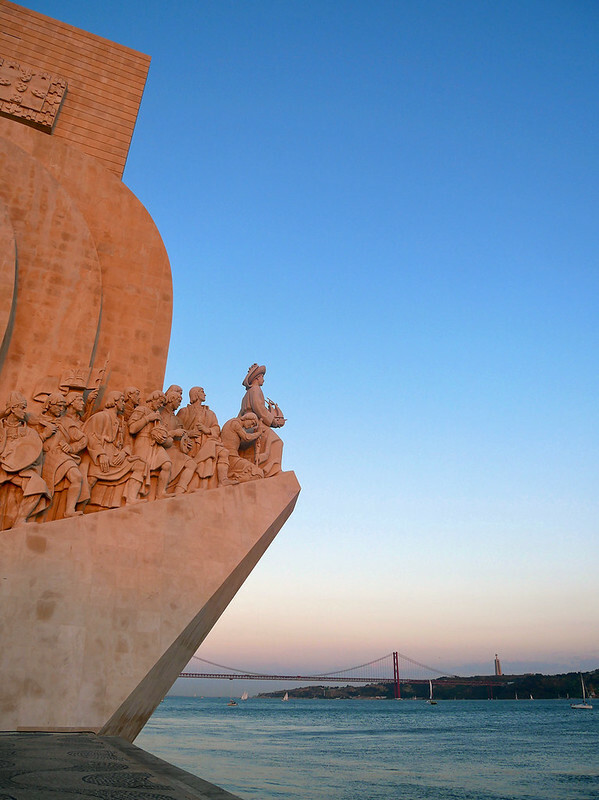 A monument celebrating the Portuguese Age of Discovery during the 15th and 16th centuries, it takes the form of the prow of a ship. Led by Henry the Navigator, the monument has 32 luminaries flanking its sides. Amongst them, Vasco da Gama, Ferdinand Magellan, Bartolomeu Dias and Saint Francis Xavier – the who’s who of explorers, cartographers and missionaries. 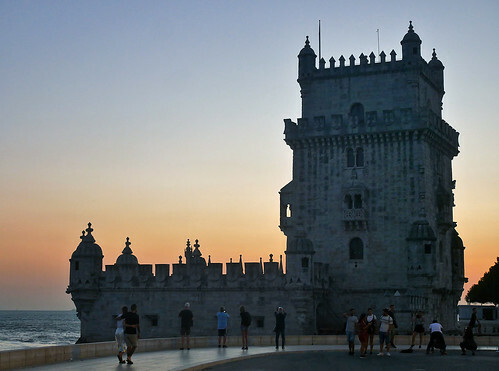 Further along the promenade lies Torre de Belém, undoubtedly the most iconic of Lisbon’s many landmarks. Completed in the early 16th-century, the fortified limestone tower is considered to be one of the finest examples of the Portuguese Manueline style. Intended to be part of a defense system at the mouth of the Tagus River, it also served as a ceremonial gateway to Lisbon. For Vasco da Gama, it would become the last memory of his homeland, as he set sail on his third and final voyage to India. 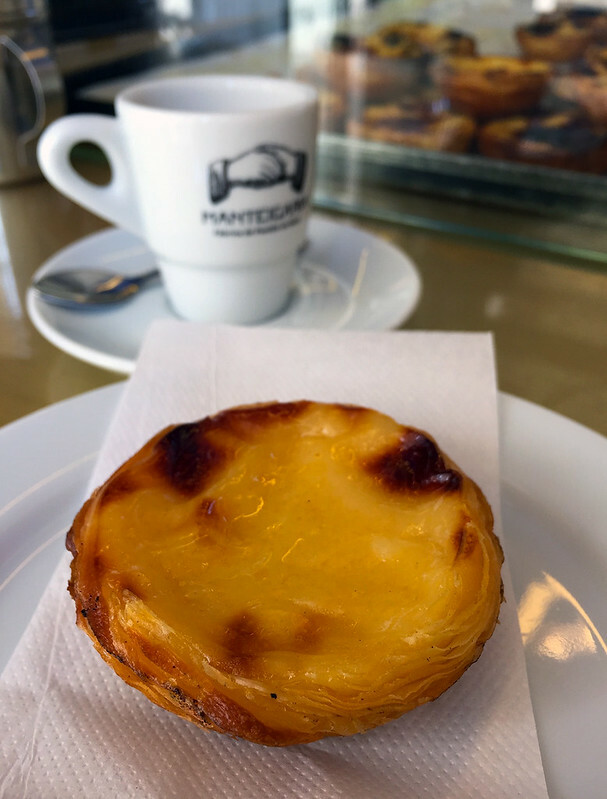 Pastéis de Nata is best accompanied with um café, and wherever you might be in the city, they consistently manage to churn out a great espresso. Over one such beverage, the owner of the cafe I’m at recommends a visit to Igreja de São Roque. Roque also happens to be the middle name of another Portuguese friend, and obviously he concurs. In a city of several dozen churches, Igreja de São Roque probably has the most sedate exterior amongst them all. But inside, its a different story altogether. 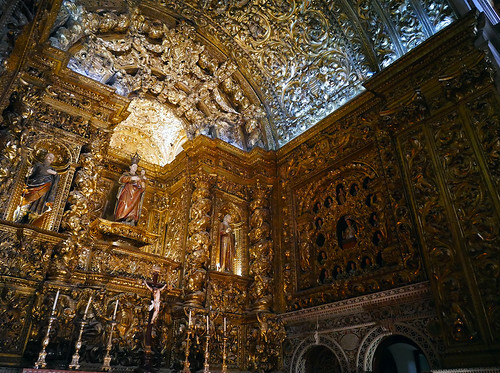 Completed in the late 16th-century, it was the first Jesuit Church in Portugal, and the Jesuits, known for creating lavish interiors, didn’t spare any effort in crafting this one. Their order was unceremoniously expelled from the country in the latter half of the 18th-century, but not before they had handed over one of the richest, most exquisite Baroque interiors in all of Portugal. 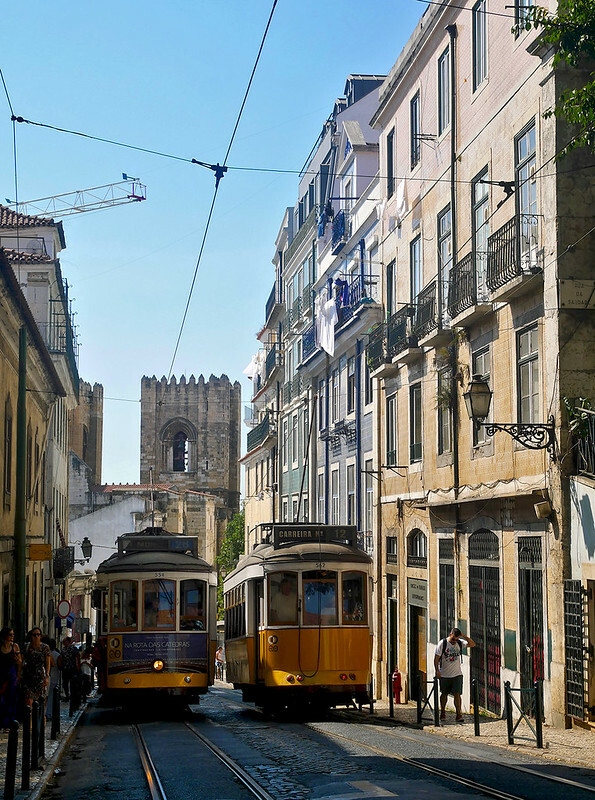 There’s no shortage of impressive landmarks, handsome monuments, stately edifices, and attractive plazas around Lisbon. But its the city’s overall aesthetic, which no doubt stems from its challenging topography, that gives it a unique character. 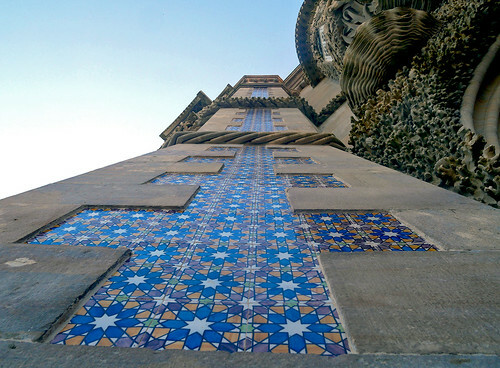 That, and some absolutely brilliant tile work. Not merely on the facade of buildings, but practically along every city sidewalk and square; the many patterns, designs, colors and arrangements of the traditional Azulejo tiles making for a visual treat wherever your hill-weary feet might carry you. One such stately edifice is Rossio Station, located right across from a sprawling, namesake square. Its the gateway to Sintra, a former abode to the Portuguese nobility, and today, one of the most frequented destinations outside of Lisbon. A World Heritage Site since ’95, Sintra is home to extravagant palaces, lavish mansions, gorgeously landscaped gardens, and a medieval castle – all set amidst beautiful pine-covered hills. Together, these historic buildings and parks straddle a universe of styles, fusing together Gothic, Egyptian, Moorish and Renaissance elements in the most seamless fashion. 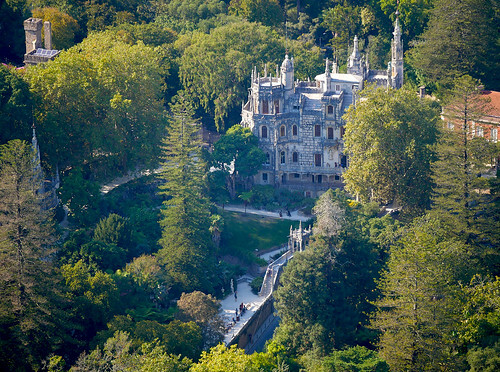 From the grandiose to the whimsical, like something out of a fairy tale, Sintra has it all. And despite what the guide books might tell you, a day trip is never going to suffice. There is just so much to see and absorb here, it can all be pretty intimidating when it comes to choosing between the many sites. Each of which occupies a respectable footprint; is guaranteed to offer a great deal more than the brochures would acknowledge, and often, is smack dab in the middle of an alluring natural setting, thats hard to ignore. I can see the plume of smoke even before we’ve parked, and Régua station is already a hub of activity by the time we get there. A 1925-vintage steam locomotive hisses away, at the head of five beautifully restored wooden carriages. Around it, eager parents assemble their excited kids for photographs, as local musicians weave their way though the platform chaos. Just a few minutes late, at a half past three, we’re on our way. Hugging the north bank of the Douro River, we make our way east to the town of Tua. 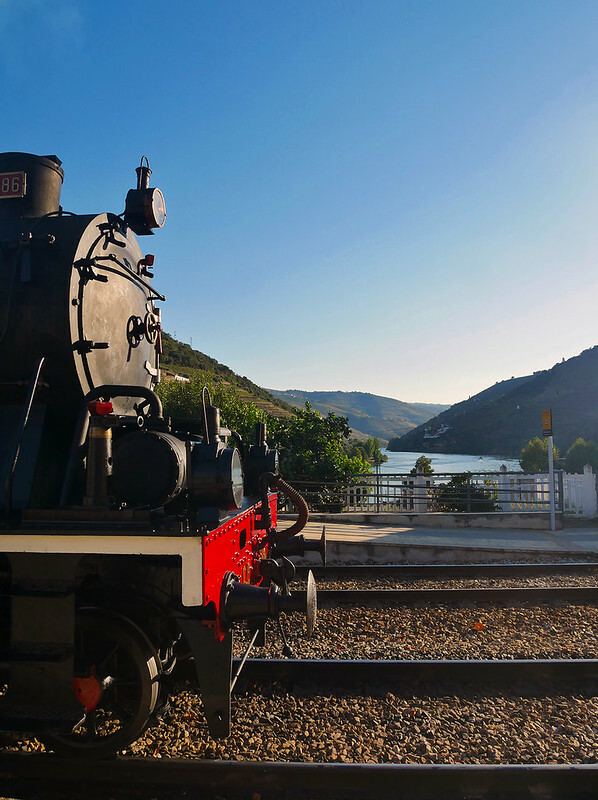 For the next hour or so, we’ll be riding through the Alto Douro or Upper Douro, an incredibly picturesque valley dotted with terraced vineyards, which collectively make up the oldest demarcated wine growing region in the world. And I couldn’t be more pleased with my introduction to it. Wine has been harvested in the Douro Valley for several hundred years, well before the region was regulated. Although grown on the slopes flanking the Douro, the wines were typically aged in Porto, where they were also traded and distributed. Getting the barrels there involved an arduous journey by river, using wooden cargo boats called Rabelos. That is until the railway arrived in the 1880s. 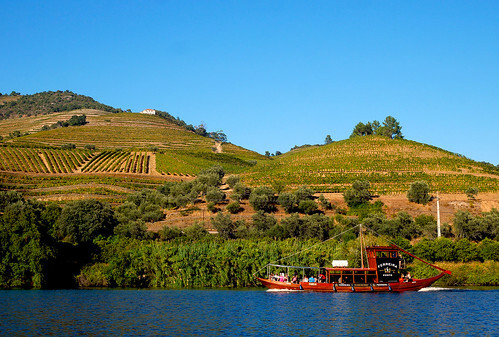 With wine tourism having picked up in recent decades, the Rabelos found new purpose, ferrying visitors upstream, most of them sailing from the charming little town of Pinhão. Taylor, Croft, Graham – some of the quintas or estates you’re likely to spot, as you sail along the river. And like me, you’ll probably wonder in amazement at all the anglicized names. Unknown to many, the English have had a long tryst with wine making in Portugal, and the production of Port itself is actually credited to them. But even if that piece of trivia doesn’t fascinate you, or your not much of an oenophile, you will, at the very least, be captivated by the remarkable beauty of the Douro Valley. Even though Port is synonymous with Portuguese wine, and in many respects, the country’s earliest ambassador, the Douro region produces just as much table wine as it does fortified wine. But since the quintas themselves are all pretty small, very little of it actually ends up being exported; the majority of production simply consumed in Portugal itself. So do yourself a favor, and while in Portugal, drink as much of this excellent, and highly underrated wine, as you possibly can. With hardly so much as a dent in your pocket, I might add. A good place to start is Régua station itself. Its large and now out-of-use freight warehouse has been repurposed suitably, mainly housing businesses associated with the region’s wine industry. 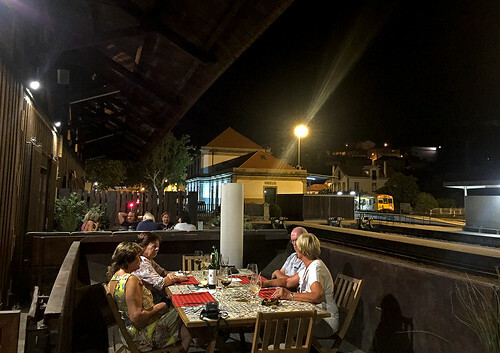 Amongst them, Castas e Pratos; an attractive restaurant and wine bar, with a lofty cellar and exhaustive wine list, where a rustic old freight wagon serves as patio seating. Its the perfect bookend to my time in the Douro Valley. Porto, the country’s second largest city, is located at the mouth of the Douro River, some 60-miles (100-km) west of Régua. If you’re arriving there by train, chances are you’ll get down at Porto Campanhã, but consider going just a little bit further, to the next and last stop, São Bento. 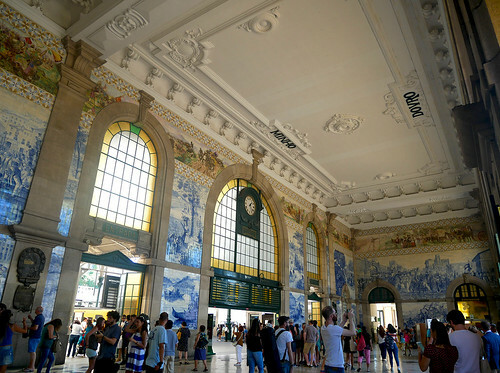 There, you’ll emerge on to the station’s spectacular main concourse, comprising 20,000 Azulejos dating from the early 20th-century, depicting everything from wars to historical events, and even landscapes. In a country renowned for this incredible art form, São Bento holds a very special place. Not far from Rua de Santa Catarina, one of the city’s main commercial arteries, lies Café Santiago. Along with a handful of eateries, its held in high esteem by locals for its version of the Francesinha. 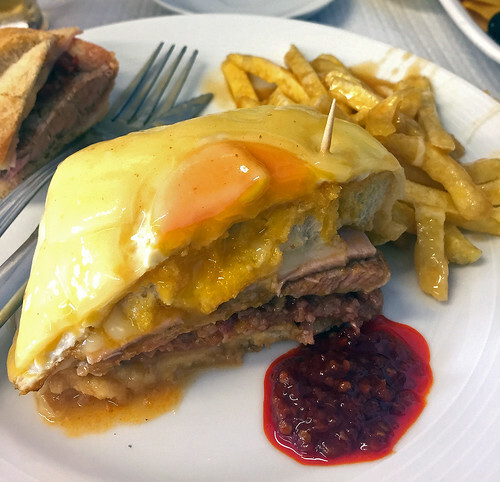 Considered by many to be the king of sandwiches, this Porto speciality is the Portuguese take on the Croque Monsieur, and means little French woman or simply Frenchie in Portuguese. A Croque Monsieur is good. Here’s how the Portuguese do it better. Between two slices of bread sit several layers of protein – cured ham, sausage, and steak or roast beef. That arrangement is then topped off with a fried egg, and generously blessed with melted cheese. Fries provide much needed emotional support. Bon appétit. 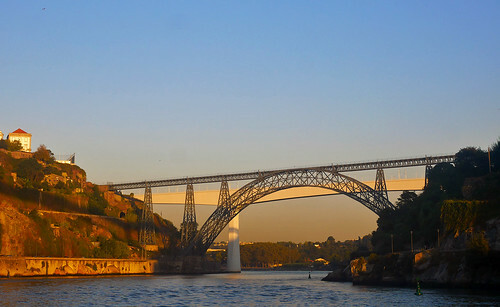 Much of the Port wine industry in the country is centered around Villa Nova de Gaia, the sister town to Porto, located right across the river from it. Its where you’d typically end up for cellar tours and tastings. Historically, as the importance of both grew simultaneously, so did the means by which to connect the two. The result, a stunning sequence of bridges – six in all – from different eras and encompassing various designs. Best appreciated from the Douro itself, multiple tour companies ply the route, both from the Ribeira district on the Porto side as well as from Villa Nova de Gaia. While the double deck metal arch Dom Luís I Bridge gets all the attention, the unsung hero, for me at least, is Gustave Eiffel’s masterpiece from 1877, which once carried the Porto – Lisbon railway. Back in Lisbon, we make our way east along the Tagus, to Parque das Nações, the city’s newest district. 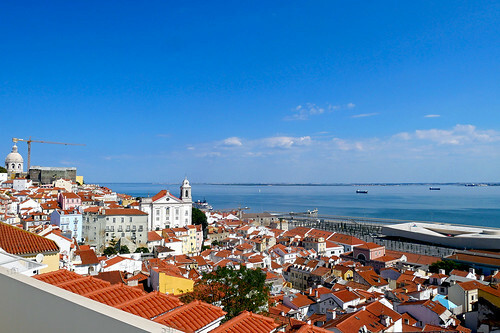 Developed in time for the Expo ’98 World’s Fair, its home to Lisbon’s most contemporary landmarks. Amongst them, Torre Vasco da Gama, the tallest structure in Portugal, and right next to it, the mighty Ponte Vasco da Gama, Europe’s second longest bridge. Telecabine, a cable car system, runs along the Parque das Nações promenade, offering panoramic views of the river and the surrounding neighborhood, notable for its modern aesthetic and architecture. The real star though is somewhat out of view. Its the very portal to the district, Gare do Oriente – Santiago Calatrava‘s stunning monument to transportation. 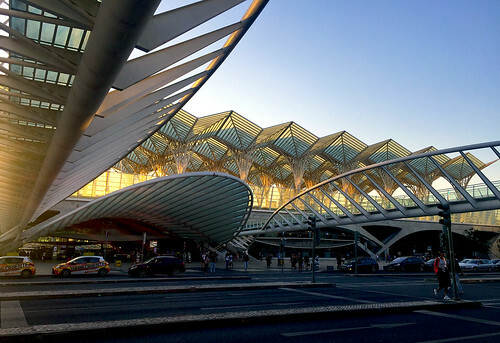 Impressive as it might be, topographically, aesthetically, and culturally, the Lisbon of tomorrow couldn’t be any more removed from the Lisbon I’ve come to know. It may as well be an independent city. And no doubt, there are the obvious merits to contemporary town planning and such, but character takes centuries to build. 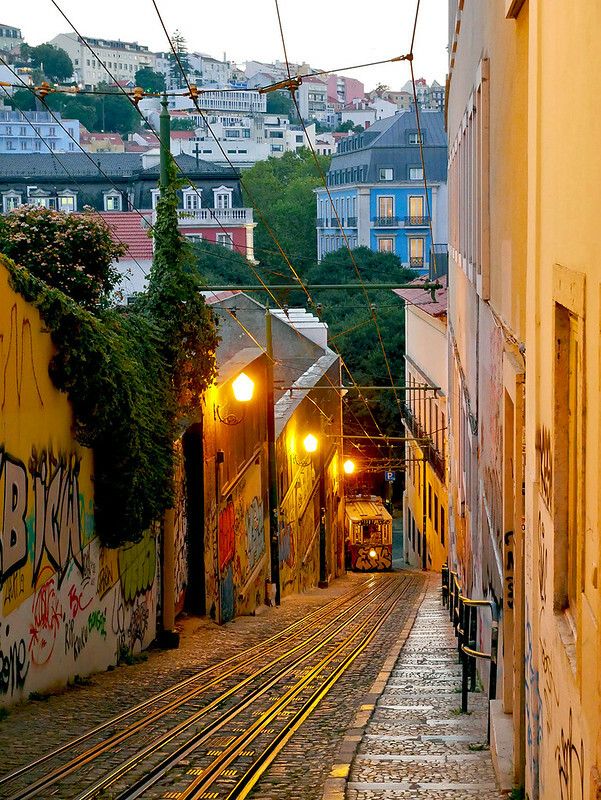 Not surprisingly, the older parts of Lisbon have an abundance of it. So without further ado, I return to Praça Luís de Camões, to spend my last few hours in the city. 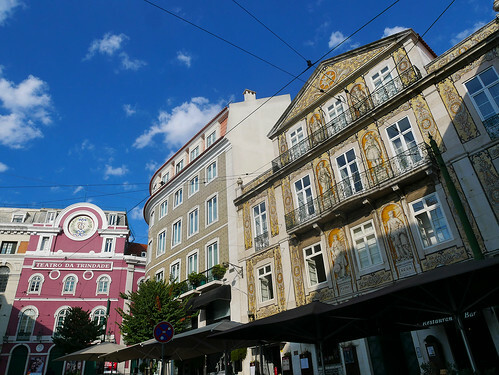 Its the vibrant little square where the neighborhoods of Chiado and Bairro Alto meet; where I’m surrounded by colorful old buildings and throngs of sun kissed locals; where a bright yellow tram rumbles past ever so often, and my go-to pasteleria is only a stone’s throw away. A full set of photos from Lisbon, Cascais and Sintra, and the Douro Valley and Porto, can be seen on my Flickr. Hi! Bharat, another excellent travelogue. As I told you before, it would be great if you could add a small map to let the readers know the route you are taking and where you are going. But otherwise, great reading! Fascinating account….only you could in your inimitable, graphic style……Super!! !